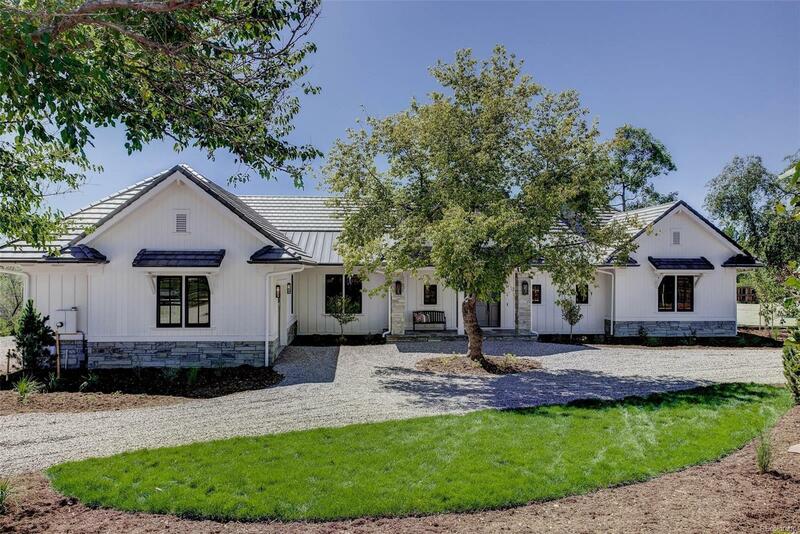 Spectacular new construction Modern Farm house in Cherry Hills Village on nearly 2 acres with mountain views! Stunning open floor plan with a magnificent view of the mountains and the pastural grounds. The centerpiece of the large great room with vaulted ceilings is a 150 year old beam from a Nova Scotia farm house & oversized gas fireplace. Wide plank European white oak floors and 10' ceilings are throughout the main floor connecting to a natural stone patio with a builtin fire pit. The kitchen will not disappoint with professional grade Thermador appliances, separated built-in refrigerator and freezer, 2 additional drawer refrigerators, 2 built-in pantry cabinets, quartz & imported leathered granite countertops and custom cabinetry. The separate master retreat features a fireplace in stone wall, a spa-like bath with a steam shower, radiant heated floor, shower pan & seat. 2 additional bedrooms each with their own walk-in closets and bath. The walk-out basement is ready for finishing.